With SK Telecom crowned as world champions for the second time, the offseason rears it’s mysterious head yet again, devouring the rosters we know and spitting them out completely disfigured. To help you keep up, we’ve aggregated all the offseason news overÂ the past month of LoL eSports to recap the chaos so far. Just looking for roster changes? Check out our roster tracker to see who’s playing where in the 2016 NA and EU LCS. Doublelift has left CLG and joinedÂ TSM. TSM announced theirÂ new coaching staffÂ and rosterÂ including Svenskeren, Hauntzer, and KaSing. Note: This roster is not final and is subject to change. CLG released Chris Ehrenreich from the Head Coach position, with Zikz taking the reigns as his replacement. CLG is hiring a Player Development Coach. Charlie has parted ways with Cloud 9 and has signed as head coach for NRG eSports. BunnyFuFu and RushÂ have joined Cloud9. Team Dignitas has added Brokenshard as their head coach forÂ 2016, with Innerflame joining as team manager, and Raz as analyst. Team Dignitas announced their rosterÂ for the 2016 season. NRG eSports has taken over Team Coast’s LCS spot and announced theirÂ roster. RenegadesÂ are in Korea to bootcamp during the offseason. Smoothie has joined Team Liquid as their starting support player. GoldenGlue announced his free agency, leaving team Immortals. Riot is looking at proposed changes for LCS player contracts in 2016. Riot has announced a new format and tournament system for qualification into the Challenger Series. Follow eSports, a new organization, purchased the roster of Team Dignitas EU, and will compete in the LCS in 2016. Febiven renewed his contractÂ with Fnatic for 2016. Deilor and Rekkles are also confirmed to be staying with the organization. Huni and Reignover have left Fnatic, and are set to join a team together in North America. Pr0lly is no longer head coach for h2k, and is now aÂ free agent. Dexter isÂ now a free agent and may declare residency in NA. Fredy122 isnow a free agent and looking for offers in NA and EU. Freeze is now a free agent. Tabzz is a free agent, leaving Elements. Vardags has left UoL and is now a free agent. Edward announced that he is no longer with Gambit and is looking for opportunities. Cabochard announced his free agency. PowerOfEvil has left the Unicorns of Love and joined Origen. Unicorns of Love announcedÂ theirÂ new roster, builtÂ around players Hylissang andÂ Vizicsacsi. Natus Vincere has announced that they will make another attempt at a LoL team, and is currently looking for players. Giants announced that Fr3deric and Werlyb, while not confirmed to be leaving, are open to shop around with other teams. SK Gaming is recruiting for a Challenger teamÂ in hopes ofÂ once again qualifying for theÂ European LCS. Amateur players PentaQ (AD Carry) and City (Support) have joined Master3 to replace Smlz and LoveCD in the bottom lane. Top Laner Loong has transferred from Vici Gaming to Unlimited Potential.Â Hetong, Peng, Xuan and World6 have also been transferred. Spirit announced that his contract with World Elite has officially ended, and is now one of the most highly valued free agents of the offseason. Dada7 announced his free agency, leaving World Elite without playing any games with the team. San has left OMG, announcing his retirement from competitive play in early November. Superstar Jay Chou announcedÂ the formation of his own eSports brand, MRJ, and will include a League of Legends team. Easyhoon, T0m, and Marin have left SK Telecom. Faker, Bengi, Scout, Bang, Wolf, L.i.E.S and KkOma agreed to renew their contracts with SKT T1. Trick, Max, and Helper will not renew their contracts with CJ Entus. CJ Entus haveÂ parted ways with their coaching staff. Koo Tigers are now known as “Tigers” after their sponsor went bankrupt. TigersÂ during KeSPA cup without “KOO” tag. Longstanding organization MVP will re-enter the LoL eSports space, with Hyunsuk Im serving as interim coach. Incredible Miracle plans to field an all star lineup in 2016,Â sparing no expenseÂ to hire the best players and support staff available in what Korean fans are referring to as a “Money Game”. GBM (GankedByMom) has left Jin Air and will be playing in the NA LCSÂ in 2016. Flash Wolves mid laner Maple will stay with the team after receiving offers from teams in North America, China, and Taiwan. Westdoor announced his retirement from competitive play. Chawy will fill the gap in the mid lane for AHQ. Hong Kong Esports wasÂ fined NT $200,000 for match fixing in the LMS playoffs. Toyz is currently looking to break his contract with the organization and has hintedÂ that he was forced to participate in the scandal by HKE owner Derek Cheung. Taipei Assassins announced their new roster, re-signing Bebe as AD carry and adding a substitute for each role. Trident Esports mid laner Claire was suspended from competing in Riot affiliated events for the first split of the 2016 OPL season. SK Telecom won the 2015 World Championship, becoming the first team in history to win twice. Faker and Bengi are the only two players to have won two world championships. 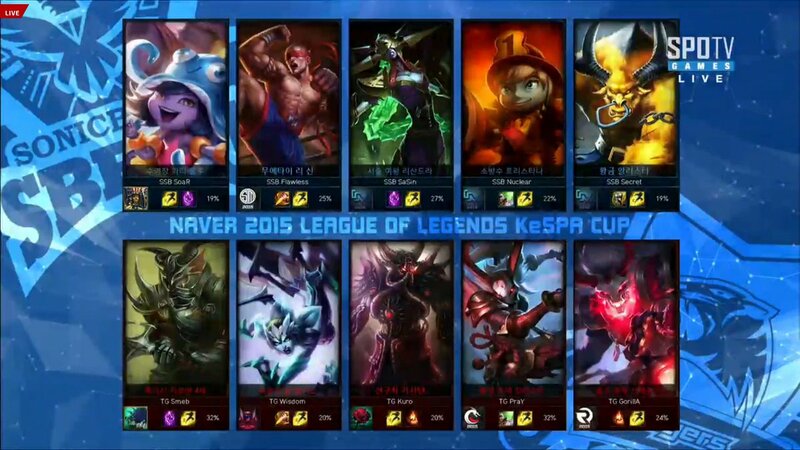 Ever, an amateur team won the 2015 KeSPA Cup, qualifying to IEM Cologne on December 20th. The team notably took down world champions SK Telecom in a 2-0 sweep during the Semifinals. Origen won IEM San Jose, earning $50,000 and going undefeated in the tournament. The National Electronic Sports Tournament 2015 (NEST) is currently underway, with seven of China’s best teams battling for a $32,000 grand prize. The 2015 All-Star voting has completed, and the regional teams have been announced. All-Star 2015 takes place December 10-14th. IEM Cologne takes place beginning December 18th and features Team Liquid, Cloud 9, and Edward Gaming, with the remaining three teamsÂ still being voted in. With IEM San Jose just around the corner, IEM has announced theÂ brackets for the upcoming IEM San Jose on November 21st. It was recently revealed that Amazon would be backing the event, boosting the total prize pool by $25,000 and holding a crowdfunded sales event at http://amazon.com/IEM to further that number. In addition, Thevoting for North American LCS teams to IEM Cologne has opened, with four teams who have not been featured in previous IEM events this year eligible as candidates. They will join the already qualified Edward Gaming from China, and the recent champions of the 2015 LoL KeSPA Cup, ESC Ever. Finally, Mark Cuban, Â owner of the Dallas Mavericks and Magnolia Pictures, will be competing against Intel CEOÂ Brian Krzanich in a celebrity showmatchÂ for charity during the San Jose event. Teams will consist of Krzanich and Cuban at the head of their own roster of former professional players. Rift pulse returns with the latest standings and news from around the scene. In the LCS,Â Fnatic closes in on a perfect season in EU and Gravity looks to take NA for their first ever bye into the semifinals. Regions across the globe are taking their final shape Â as we look towards the 2015 World Championship. Calitrlolz will be leaving the LCS after the Summer Split,Â stating on twitter that this weekend will be his last. Andy “Reginald” Dinh will step in as Head Coach for Team SoloMid as of Monday, July 20th. Ram “Brokenshard” DjemalÂ will coach Team Dignitas in place of Sami “Rico” Harbi as he tends to personal business. Adrian “Adrian” MaÂ has stepped down from Team Impulse, citing that he does not feel like he is part of a team. XiaoWeiXiao has been suspended pending investigation into Eloboosting allegations. Team Roccat has added Korean Top Laner Jae Seung “Dart” Jin to their roster. No official announcement has been made regarding the addition. Jungler Mateusz “Kikis” Szkudlarek has stepped down from Unicorns of Love, and joined Challenger team Gamers2. Unicorns of Love add Berk â€œGiliusâ€ Demir as starting Jungler,Â as well asÂ Cho “H0R0” Jae-hwan and Karim “Airwaks” Benghalia as substitutes for theÂ Jungler position. Forg1ven has been suspended for the next four games due to excessive negative behavior. Gambit added 3 new substitutes to their roster inÂ Amaury “Moopz” Minguerche, Pierre “Steelback” Medjaldi andÂ Karim “ImSoFresh” Bbahla. They will play with Moopz in week 9 in light of Forg1ven’s suspension. Tony “Shlaya” Carmona has been added to Fnatic as a substitute mid laner. LMS playoffs will take place July 24-26. Schedule below. ESL will begin testing for PEDS (Performance Enhancing Drugs) at ESL OneÂ Cologne, and all future ESL and IEM events. Tickets to the Semifinals of the 2015 World Championship go on sale July 22.
images via lolesports. Banner via Chefo. Rift pulse returns with the latest standings as we moveÂ past the halfway point of the summer split. WithÂ only 3 weeks left in the EU and NA LCS, teams look to make their final run at a playoff position. After injuring his hand playing basketball, CLG may opt to use substitute AD carry Trevor “Stixxay” Hayes inÂ place ofÂ Yiliang “Doublelift”Â Peng. Plagued by visa issues, TDK will continue using substitute players in week 4. Zachary “Mancloud” Allan HoscharÂ and James “Lattman” Lattman willÂ fill the void in TDK’s roster for week 4. Rift pulse returns with the latest standings as TSM and Fnatic reign at the top of the NA and EU LCS. Plus, a look at the 2015 World Championship seeds, and other scene news. Â Team Gravity announced that Head CoachÂ Nick “LastShadow” de Cesare is leaving due to emerging personal issues. Team Dignitas added former CJ Entus and Winterfox junglerÂ Dong-jin ‘Helios‘ Shin to their starting roster, in place ofÂ Andrew ‘Azingy‘ Zamarripa. Riot has released information for the 2015 World Championship regional seeding. The LPL Summer English casting team has been revealed, with 3 new casters joining the lineup. Trevor â€œStixxayâ€ Hayes was suspended from competitive play for 2 weeks forÂ abusive behavior. Escalate Legion Gaming has been barred from competitive play until the spring of 2016 after engaging in ringing and account sharing. Geico has made it’s foray into eSports, sponsoring Team SoloMid as well as a Hearthstone Tournament series. Rift pulse is back with another weekly update of the most recent events in LoL esports. With the NA and EU LCS back in full swing, the second half of season 5 has officially gone global. CLG announced their new coaching staff,Â withÂ Chris â€œBlurred Limesâ€ Ehrenreich stepping in as Head Coach. Ex Nihilo, a new organization, has formed a team consisting of a blend of former LCS players and Challenger players. Â Gambit Gaming announced that they will have a two-week trial period forÂ KÃ©vin “Shaunz” Ghanbarzadeh in the head coach position. Mike “Wickd” Petersen announced on twitter that his team has signed to Denial eSports. Jesse â€œJesizâ€ Le andÂ Luka â€œPerkZâ€ PerkoviÄ‡ join Gamers2 in their fourth attempt to make the European LCS. Pierre “Steeelback“Â Medjaldi has left Fnatic in wake of Rekkles return, joining Odyssey GamingÂ in their pursuit of qualifying to the the NACS. The NA LCS Summer Finals will be played in NYC, with the EU finals heading to Stockholm. IEM announced theÂ details of Season 10, with the World Championship once again taking place in Katowice. Rift pulse is back with another weekly update of the most recent events in LoL esports. With the EU and LCS less than a week away, and both the LPL and LCK already in action, rosters are finally taking shape across every region. Brandon “Saintvicious” DeMarco stepped down from Gravity,Â joining Team CoastÂ as their Head Coach. Team 8 acquires Zach “Nien” Malhas and Chad “History Teacher” Smeltz, as starting AD Carry and Head Coach respectively. Min-su â€œMoveâ€ Kang joins Gravity Gaming, taking over the starting Jungle position. Johnny “Altec” RuÂ finds a new home in the LCS,Â this time as the starting AD carry position for Gravity Gaming. Ainslie “Maplestreet” Wyllie will sub forÂ Misfits in the NACS as JebusÂ has run into visa issues. TDK adds Jin-Hyun â€œEmperorâ€ Kim Â andÂ Geon-Woo â€œNinjaâ€ Noh to their starting roster. Team Winterfox unveiled their new roster, with former Gambit Gaming AD CarryÂ Kristoffer â€œP1noyâ€Â Albao Lund Pedersen taking over as Starting AD Carry. InnerFlame joins Gamers2, assuming the role of Team Manager. Team ROCCAT has announced Etienne â€œSteveâ€ MichelsÂ as their new top laner, also adding EXORKK as a substitute AD Carry. OMG has revealed their rosterÂ for the 2015 LPL Summer Split, with Hu “Xiyang” BinÂ moving to the top lane. PapaSmithy has joined OGN as they opt into a four-day schedule. OPL Summer will begin on May 25th, 2015. Cloud 9 announces their partnership with Intel. The LCK and LPL have both started back up, wrapping up week 1 of the 2015 Summer Split.